As Robbin Kelley Rasmussen faces the Vietnam Veterans Memorial in Washington D.C., the world around her is silent. The people standing near her become distant and she is found face to face with her father once again. An overwhelming presence comes over her, as she sees only his name and her reflection against the granite wall. Rasmussen refers to the power the wall has as “wall magic,” both very overwhelming and satisfying. 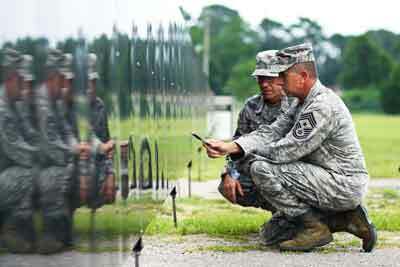 That longing for connection has taken her to the memorial, known generally as the Vietnam Wall, in Washington several times to see the name of her father, Harvey Kelley, a captain in the A Company, 1st Battalion, 18th Infantry, 1st Infantry Division. He was killed in action on Nov. 20, 1969. Rasmussen has also made a trip to Vietnam to see where he was killed. “I work with an organization called Sons and Daughters In Touch and the first time I went to the wall was in 1993 and every four to five years we have a reunion for the sons and daughters whose dad’s names are on that wall,” Rasmussen says. “We get together and wash the wall, do a rose ceremony: we always do this on Father’s day, have a ceremony at the wall in honor of our fathers.” Rasmussen speaks openly about her experience at the wall, saying her connection with her father is stronger at the memorial and it is where she feels she is most connected to him. “To be at the wall, unlike my father’s grave, it seems like he is there and that is a feeling that I know personally many of the sons and daughters feel. We all feel their presence there. For me it is a way to visit my dad,” Rasmussen said. On Veterans Day, 1996, the Vietnam Veterans Memorial Fund unveiled their solution for those veterans or family members unable to make the journey to Washington D.C., a half-scale traveling replica of the Vietnam Wall named The Wall That Heals. Local veterans and families now have the opportunity to witness The Wall That Heals as it returns to Omaha over Memorial Weekend. The wall will remain in Omaha for a week, May 29-June 5, leaving time for travelers coming in from out of town. The Wall will be included as part of the annual Memorial Day ceremony on May 30, at 11 a.m. conducted by The Vietnam Veterans of America and the Heroes of the Heartland Foundation. Since its dedication, The Wall That Heals has visited more than 300 cities and towns throughout the nation, spreading the heroes’ legacy to millions. The replica stretches nearly 250 feet in length and the site will include an information center, traveling museum and computers, and volunteers will be available to assist visitors in locating names on. Visitors may also leave items in tribute at The Wall That Heals. Family members of veterans like Rasmussen hope The Wall That Heals can bring comfort and opportunity for individuals in the area unable to make the trip to Washington D.C. “Heroes of the Heartland has worked persistently to make this as serene as the wall in Washington D.C. so people can have that powerful experience. It’s not just a wall sitting out on a baseball field, it’s at Memorial Park where the monuments that represent all of our men and women that have been killed or served in all of our wars, it really brings it home so you are in a place of respect, serenity and beauty,” Rasmussen said. Her experiences at the Vietnam Wall in Washington have inspired Rasmussen to continue her support of the traveling wall. She hopes that with the wall coming to Omaha, she can spread her message of comfort and support to individuals who may be visiting the wall for the very first time. “I really challenge myself to help those who are feeling trepidations about going or have emotions of fear, because that does happen. The wall can be very overwhelming and I really want to help because I have been there and have had a lot of experience with this situation,” Rasmussen said. Rasmussen’s experiences have also prompted her to reach out to veterans still suppressing emotions from the past. She knows why it can be so difficult for individuals to return, not wanting to see their loved one’s name. “When you think about many of the names, some of them were their best friends in the world, maybe they only knew them for a couple months but when you are in a combat situation, you become quite close very quickly,” Rasmussen said. “There is a lot of guilt for these men who have survived combat that ask why did I make it and they didn’t. What I personally what them to know is that I am really happy that you did make it. I am happy that you made it and that you can come here to Omaha, Nebraska, and you can see this and share it with all these people.” Rasmussen, along with dozens of individuals in the Omaha area, wait with anticipation to see The Wall That Heals honor Omaha with its visit over Memorial Day. She hopes the wall will not only be visited by veterans and loved ones but that even individuals who may not know a specific name on the wall will visit and understand the importance of its existence. “What I would really like for them to understand is that these 58,000-plus names on that wall each were a human being that somebody loved and cared for. Each person on that wall had a family member, a person that loved them,” Rasmussen said. “I think at times there are so many monuments towards the heroes of our nation and they are lovely but with this one, read the name, understand that there is somebody behind that name. I encourage people to go, pick a name, maybe touch one of them and understand that somebody loved this person very much and it is a real person.” The Wall That Heals will be included as part of the annual Memorial Day ceremony May 30, at 11 a.m., conducted by The Vietnam Veterans of America and the Heroes of the Heartland Foundation at Memorial Park, 60th and Dodge. It will be available for viewing, 24 hours a day, May 29-June 5. For more information about The Wall That Hills visit VVMF.org.